The following are some of the many quilt kits, and other items available at the studio. Please call the studio to purchase yours today! See studio for deails. While quantities last! Approx. Size: 37" x 46"
Contains Charm package of print fabric, sashing, & background fabric, binding & pattern included. Contains: 8 - 1/4 yard cuts of print fabric, background fabric, and pattern included. Contains: 3 yards print fabric and 4 1/4 yards background fabric, binding and pattern included. Contains: 12 fat eight strips of print fabric, sashing, background fabric, binding & pattern included. Kit Includes: Complete top, Borders and Binding. Includes 2 yards background fabric, 1 yard focal fabric, and 7 fat quarters for accent fabrics, and binding. This kit contains Elizabeth Hartman pattern (multiple sizes on pattern) fabric to complete this quilt top , backing, batting and binding not included. This is an adorable quilt and makes up quickly. Kit comes complete with pattern, background and fabrics to complete this quilt top. This kit includes pattern, quilt top fabric and binding. Approximate Size: 50" x 70"
A great way to start the day... Get Inspired! Price $50.00 plus tax includes pattern, background, 2 1/2"fabric strips to create this cute little quilt for the little one. 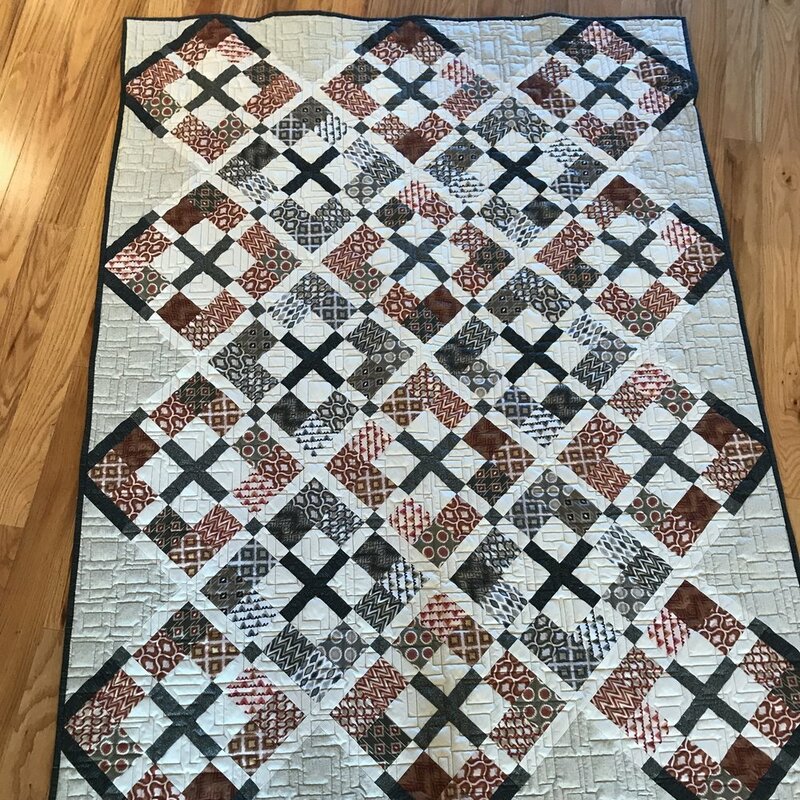 This beautiful quilt Pattern Kit contains fabric to complete top and binding (55” x 63”) is available at the studio. While supplies last. There are only a few left in stock, so stop in before they are gone.